Encompassed by the spectacular mountain range, and overlooking the valley below, lies the town of Arta. 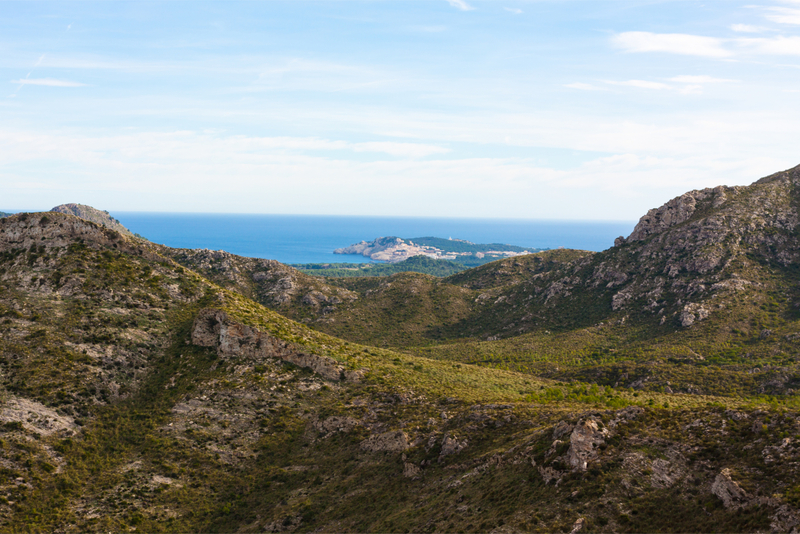 Untouched by tourism and demonstrating traditional architecture at its finest, it’s easy to see why Arta is one of Mallorca’s most precious gems. Famous for its handmade pottery, and hand woven baskets - Arta transports you to a forgotten Mallorca and allows you to detach from modern day life; it really is paradise. Arta is situated about an hour's drive from Palma de Mallorca airport, following the motorway towards Manacor, before turning into Arta. The journey is simple and easy by car, but for non-drivers the 411 bus is also accessible. Although this bus service doesn’t run direct from the airport, there are numerous buses that could bring you into the intermodal station and allow you to catch this regular service into Arta. Tickets will cost in the region of 10€, and the journey time is around 1 hour. It is worth noting that during the winter months you may be expected to take the train into Manacor and then transfer onto the bus; due to limited services operating at this time of year. The spectacular sight of San Salvador is simply unmissable! Sitting proudly at the top of Calvary Hill, this exquisite sanctuary towers above the town. Home to a spectacular, multi coloured carving of the Virgin Mary (which is rumoured to have been brought to the island during the Medieval Conquest) this impressive building can be accessed via a winding stairway from the church, or via a narrow road. As well as providing insight into a previous life here on the island, you are also rewarded with astounding views across the countryside. The sanctuary is surrounded by nine towers, and the remnants of a metre thick wall, created to protect the main building. One of the best preserved Bronze Age settlements on the island still stands in Arta today. Comprised of several rooms, a watchtower and a spectacular entrance hall constructed with three stone slabs, weighing almost eight tonnes each! The settlement is believed to date back to early 900 BC - a real feat of architecture and construction at its finest! Arta’s market is one of the most sought-after markets on the island, attracting tourists from far and wide. Displaying handmade crafts (in particular pottery and baskets), fresh produce, jewellery, and clothing; there really is something for everyone! Arta is a great base in terms of getting around the north east coast of the island. Just a few minutes from the coastal resort of Cala Ratjada there are boat trips and water sports a plenty! However, Arta has its own jewel in the crown and this is the famous ‘Coves d’Arta’. 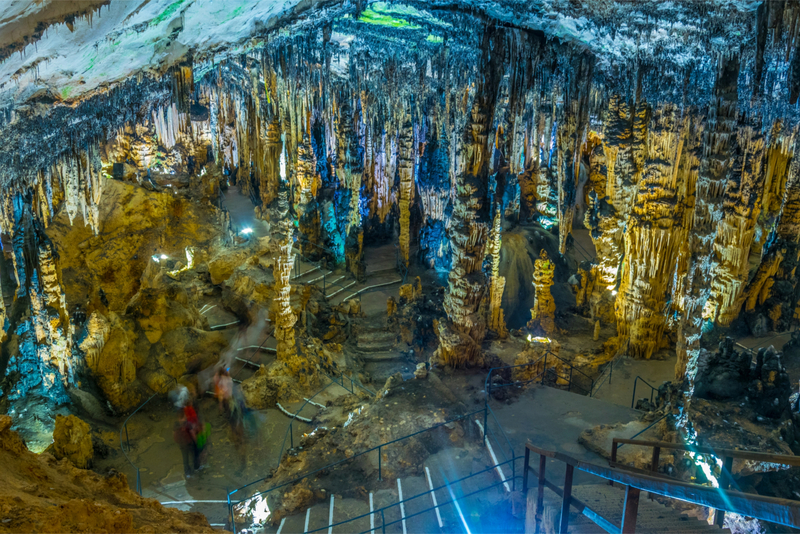 These spectacular caves are not to be missed! 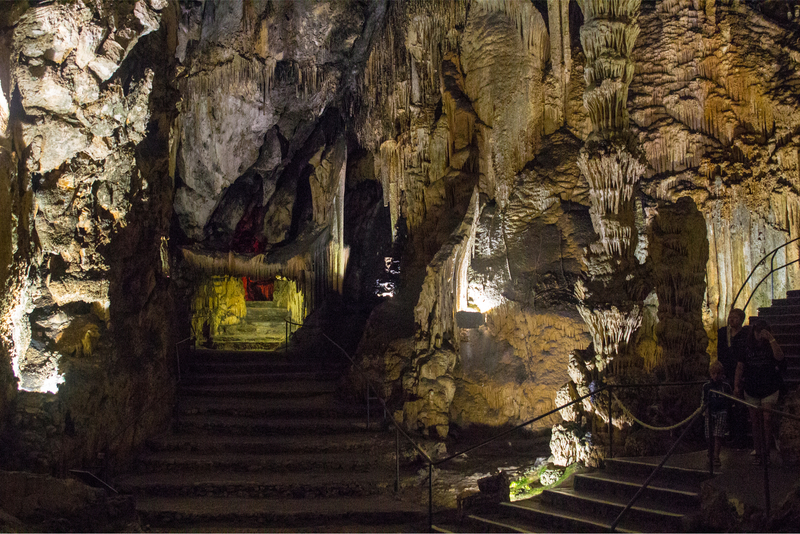 The impressive display of stalagmites and stalactites, glistening in the underground cavern, is simply breathtaking! Entrance to the caves costs 15€ per adult and 7€ per child, and they are open all year from 10am (although closing times vary between 5pm-7pm depending on the time of year). This fun filled day out is not to be missed, and with a cafe and bar on sight, why not make the most of lunching at one of the most beautiful areas on the island! Between the 27th July and the 7th August, Arta celebrates San Salvador. This 10-day fiesta incorporates music, dance, food, sporting competitions and a huge ‘flower power’ party; all in honour of the town’s very own patron saint! As with many Mallorquin fiestas, the celebration is rounded off with a firework display, to mark the end of the festivities. Arta also hosts its own Fira (fair), showcasing its agricultural heritage, local market stalls, food stands and displays of dance and drama from the local school students. This family festival is held on the second Sunday of September, and is an annual occurrence. Along with the rest of the island Arta also celebrates Sant Antoni (patron saint of animals) on the 16th January. This demon-filled fiesta sees parades and bonfires lining the streets of the town, accompanied by traditional song and dance and a religious ceremony- it really is one not to be missed! As with many towns on the island, you’re never stuck for somewhere to eat! But certain restaurants have the edge! Restaurant Es Taronger is one of those! Offering traditional Mallorquin cuisine, in warm and cosy surroundings this fabulous restaurant is also incredibly affordable! With a menu del día at just 9.90€ (including a glass of wine and 3 courses) you can guarantee a full belly without having an empty wallet- perfection! The service is efficient, the setting ambient and dishes delicious! Restaurant Es Taronger is a must on any visit to Arta! For a real Spanish experience, you cannot beat S’Estacio. Serving traditional dishes, at incredibly low prices, this humble restaurant would be easy to miss! However, for one of the best paellas on the island- it is a must! Located close to the Greenway walk/cycle path, this small cafe/bar serves up great food all day long, and at just 9€pp for paella, you can eat well for less! This hidden gem really is perfect for weary hikers and cyclists who want a large meal, at a low price! 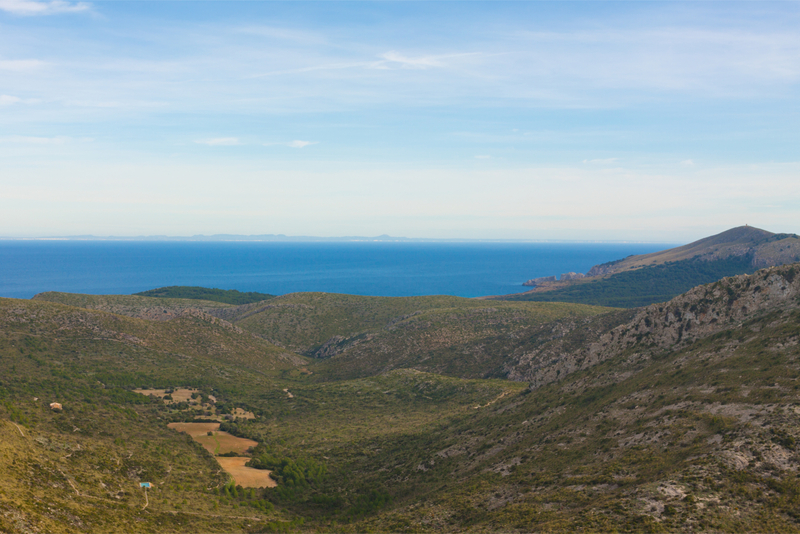 For budding cyclists and walkers, Arta offers the most perfect trail on the island. The Greenway links the towns of Son Servera, Arta, San Llorenc, Son Carrio and Manacor together. This 29km route crosses into all the beautiful towns across the north east coast, with plenty of places to park up for a picnic, or pop into a local bar or restaurant for lunch- it’s fabulous! Originally designed as a railway, but now converted to a flat walkway for all to enjoy, it is the perfect way to explore this corner of Mallorca. Average rental prices in Arta are relatively affordable, starting at around 700€ per month and reaching up to 1,150€ per month (based on a 3-4 bedroom property); this is around 100€ cheaper than the neighbouring coastal towns of Cala Bona, Cala Millor and Cala Ratjada.